We welcome visitors! Please call ahead to make an appointment. 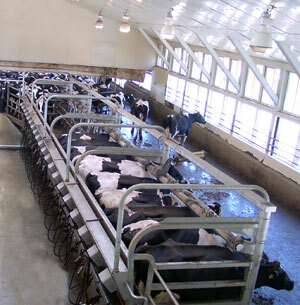 Since this is a working farm, we want to make sure that we will be able to accommodate you. We do have an observation area, but prefer to give you a personal tour so you can learn more about dairy farming and our cows. Tours are available seven days a week, for adults and children third grade and higher. There is no charge for a tour. Our visitors learn about modern agriculture, including the milking process, where cows are housed, feeding, milk storage and nutrition. Your tour guide is a farm employee who will be happy to answer your questions. If you want to just go to the observation area, please stop by the office first to let us know you're here. We will not be milking between 2-4 p.m.